In late May and early June, the tulip trees of Pier Park come into bloom. Few notice these exotic flowers, as they lack the showiness of rhodys and dogwoods and they don’t appear until after the tree has leafed out. It takes a careful glance up and into the branches of the tree to see these yellow flowers with their orange flare at the base. 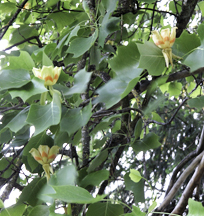 Both the shape of its flowers and its leaves give the tulip tree its name. 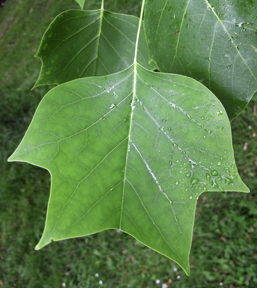 The tulip tree is native to Eastern North America and is in the magnolia family. It is the state tree of Kentucky, Indiana and Tennessee. The wood has been used for furniture, plywood, boatbuilding, paper pulp and general lumber. It’s a large deciduous tree, growing upward to 150’ – although 70 – 90 ‘ if more common. 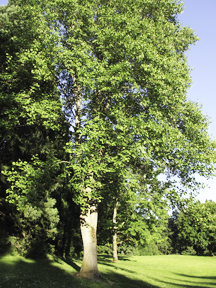 Pier Park is home to two tulip trees, both located just on the northwest end of the sequoia grove – one near the service road.